Lovingly nicknamed “The Big A,” Anaheim Stadium opened its doors in 1966. Over the decades, it has hosted up to 69,000 cheering fans, dozens of playoff games, three Major League Baseball All Star Games and one World Series championship. 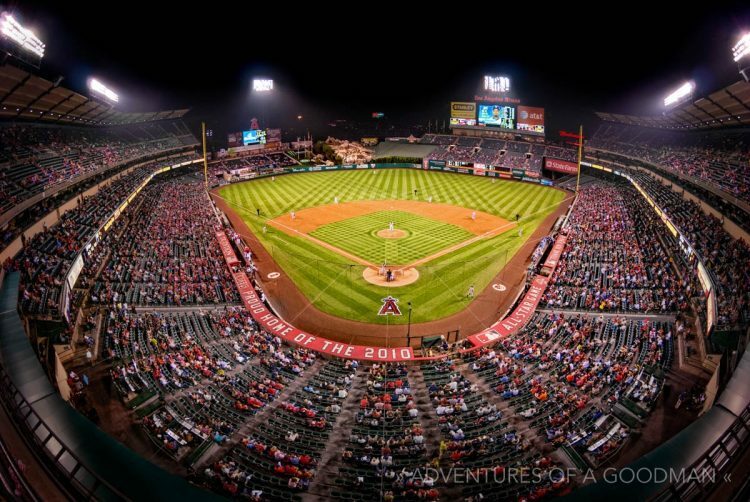 Now known as Angel Stadium of Anaheim, the ballpark is the fourth oldest in baseball. Only Fenway Park, Wrigley Field and Dodger Stadium have been around for longer. The photography on this page was created during a road trip to Los Angeles in 2011. While there, I took in an Angels baseball versus the World Series-bound Texas Rangers. I couldn’t tell you who won, but I’ll always remember that I caught a foul ball! OK, so I did some research. The Angles beat the Rangers by the final score of 7-4. Who knew! I Caught a Foul Ball!!! The Angles were up. I’m pretty sure the batter was Mike Nappoli. Me and my buddy Meeks were 7 rows behind 1st base. The ball went up. It looked like it was coming right towards me. I looked up. Put both of my hands together. And it landed in my hand! A wave of pure childhood glee swept over me as I started screaming in the least-manly way possible. I’ve been to hundreds of baseball games and have never even come close. Even writing this story, a year later, still brings a huge smile to my face! When the California Angels came into existence in 1961, they played their home games at Wrigley Field (the minor league ballpark in Los Angeles, not the big one in Chicago). From 1962-1965, the Angels had to share a stadium with their cross-town rivals, the Los Angeles Dodgers. The Big A in the parking lot is taller than anything in any surrounding neighborhood. Finally, in 1966, Anaheim Stadium officially opened. Angels fans have called it home ever since … even if the name has changed a few times. From 1993-2003, the ballpark was known as Edison International Field. Then, after Edison International opted out of their naming rights in 2004, the stadium was rebranded as Angel Stadium of Anaheim. 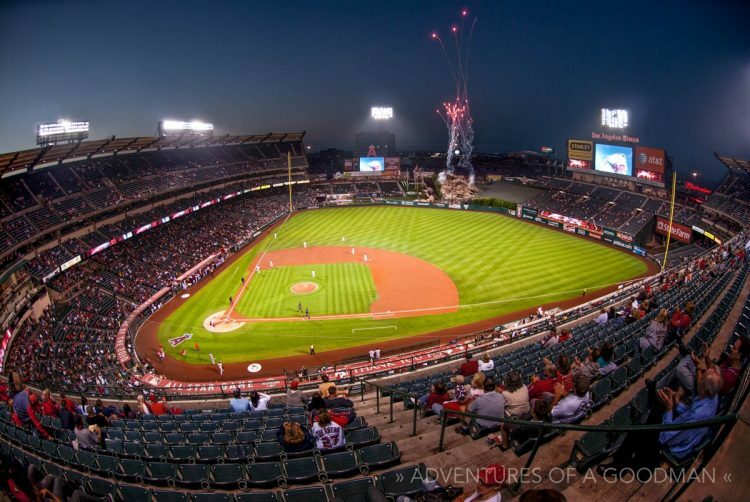 While that remains its name to this day, some locals and old-timers can still be caught calling the venue by its original name: Anaheim Stadium. Located in the suburban neighborhood of Anaheim, California, the stadium is situated between Katella Avenue to the north and the Orange Freeway to the east. There’s pretty much nothing in the surrounding area except freeways, office buildings, homes and parking lots. FUN FACT: The Los Angeles Rams football team played their home game at Angel Stadium of Anaheim from 1980-1994. Take a look at the giant baseball hats in the first photo of the front of Angel Stadium of Anaheim. Now look at the second photo. Those abstract-looking lines are actually the metal frame of the giant baseball hats, shot from inside and below at 13mm. From 1980 – 1994, the Angels shared Anaheim Stadium with the Los Angeles Rams football team. However, when renovations began in 1996, the ballpark reverted back to a baseball-only facility. It remains so to this day. Renovations included the installation of outfield bleacher pavilions, a video display board and an out-of-town scoreboard below the right field seats. All of the multicolored seats were replaced by green seats. The exterior of the stadium was also renovated. The concrete structure and ramps were painted a combination of green and sandstone. Much of the facade of the stadium was torn down to create a more open feeling for visitors. The most notable feature of the entire renovation, however, was a “California Spectacular” in which geysers erupt and a stream cascades down a mountainside (Pride Rock) covered with real trees, artificial rocks behind the left-center field fence, and new bullpens. Fireworks shoot out of the display at the start of games, after every Angel home run and after every Angel win (they had been shot off from a parking garage before then). I’m pretty sure I identified this seat as the farthest from home plate in right field. The images in this post are a part of my photographic series: Baseball Stadiums With a Fisheye. Highlights include: Shea Stadium, O.Co Coliseum and New Yankee Stadium.